One of the most common questions I get about using humor is, “How do I make sure it’s appropriate?” Previously, we’ve talked about the importance of understanding your Humor MAP. That’s definitely still true. But another thing that can help is to understand the four styles of humor (as defined by Rod A Martin). These styles are: affiliative, self-enhancing, self-defeating, and aggressive. This is a way of amusing others to facilitate relationships. It is positive and inclusive. Think Ellen Degeneres. In the workplace, it includes: team-building activities, applied improv training, and dance parties. This is finding amusement in life’s hardships and staying positive. It is positive and focused on yourself. It’s what Kurt Vonnegut is suggesting when he said, “Laughter and tears are both responses to frustration and exhaustion. I myself prefer to laugh, since there is less cleaning up to do afterward.” In the workplace, it includes: gamifying your work, listening to music during certain tasks, and reading emails in an accent in your head. This is saying funny things at one’s own expense. It’s a negative form of humor but the target is yourself. Rodney Dangerfield was the master of this. In the workplace, it includes poking fun at yourself when leading a meeting, commenting about your appearance, or coming up with a witty line as to why your email is late. This is using humor to disparage others as a way of manipulating them. It’s the humor we see so often in the form of some memes, The Daily Show, or the late, great George Carlin. In the workplace, this is sarcastic comments, mocking people, or giving co-workers mean-spirited nicknames. Now, as you may have assumed, some forms of humor are more appropriate than others. Affiliative and self-enhancing are almost always good for the workplace. Self-defeating humor is good IF you are in a high status position and are using it to let people know you don’t take yourself too seriously. You want to use it sparingly so that people don’t think you’re throwing a pity-party or have low self-esteem. Aggressive humor rarely has a place in the workplace. This form of humor can be great for catharsis but it doesn’t usually lead to change (other than the change that people dislike you). It’s better to find a way to use affiliative or self-enhancing. 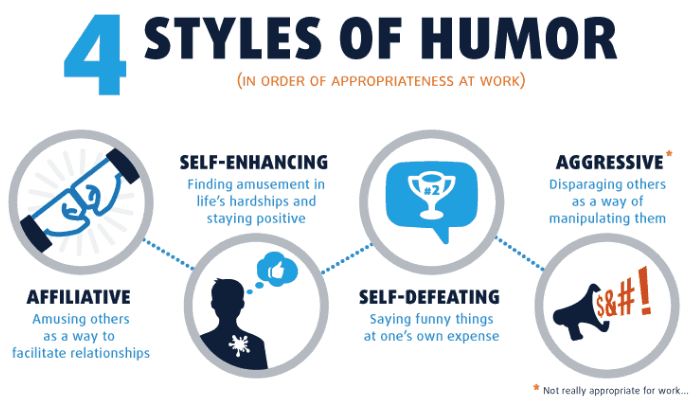 So as you think about using humor at work, think about what style is right for the situation. What do you think? 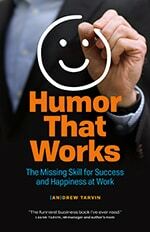 What kind of humor do you use most at work?